Slice up some apples to make our Slow-Cooker Pork Tenderloin with Apples! 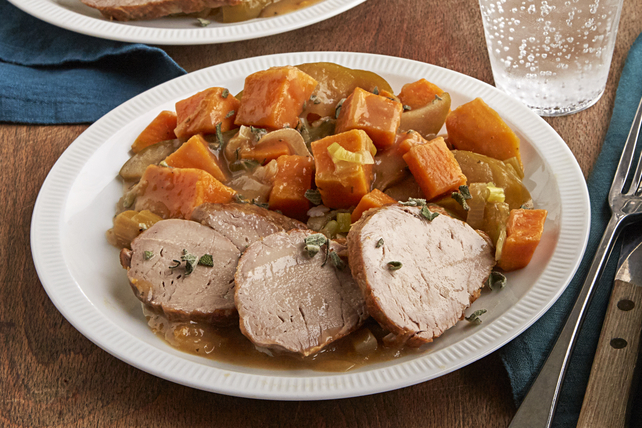 Sweet potatoes and apples sweeten this slow-cooker pork tenderloin entrée. Cook meat in nonstick skillet on medium-high heat 4 min. on each side or until golden brown on both sides. Remove from heat. Trim leek; discard dark green portion. Cut leek lengthwise in half; rinse well. Cut each piece crosswise into 1/4-inch-thick slices; place in slow cooker sprayed with cooking spray. Top with potatoes and apples. Whisk flour, mustard and dressing in medium bowl until blended. Stir in apple cider. Add to vegetable mixture in slow cooker; mix lightly. Top with meat; cover with lid. Cook on LOW 4 to 4-1/2 hours (or on HIGH 2 to 2-1/2 hours). Transfer meat to cutting board, reserving vegetable mixture in slow cooker. Stir vegetable mixture; cover with lid. Loosely cover meat with foil; let stand 5 min. Slice meat; place on serving plate. Sprinkle with sage. Serve with vegetable mixture. Substitute butternut squash for the sweet potatoes and/or fresh parsley for the sage. For easy cleanup, use a plastic slow-cooker liner before adding ingredients to slow cooker as directed. Searing the meat in the skillet before adding it to the slow cooker helps to seal in the meat juices, resulting in more flavourful meat. As a bonus, the sweet potatoes in this delicious dish provide an excellent source of vitamin A.